NASA has launched an interactive, educational video game called NetworKing that gives kids an insider's perspective into how astronauts, mission controllers and scientists communicate during space missions. NetworKing can be played online by installing a small browser plugin or can be downloaded to a computer for offline play. 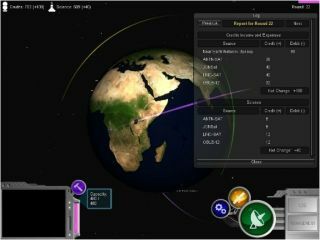 Developed by staff at NASA's Ames Research Center at Moffett Field, Calif., the game depicts how the Space Communication and Navigation (SCaN) network operates. Players start small with one a single command base on Earth and can take on several clients who are operating Near Earth Network satellites. As they gain scientific and technological expertise, manage their network’s capacity and respond to calls for repair, they can construct a larger and more efficient network. With enough resources, players can acquire more complex clients, such as the International Space Station, Hubble Space Telescope and the Kepler mission, and move into deep space. Brief interactive tutorials are provided at the beginning of play and additional prompts will appear as play progresses if the system detects an action is needed on the part of the player. In conjunction with NetworKing, the 3D Resources website also links visitors to the Station Spacewalk Interactive Game and the SCaN Interactive Demo that demonstrate the interaction between SCaN's ground-and-space facilities and NASA spacecraft. To play the NetworKing game, go here. This story was provided by TechNewsDaily, sister site to SPACE.com. Follow TechNewsDaily on Twitter @TechNewsDaily or on Facebook.